Believe it or not, Ultimatehaunt.com’s beginnings are similar to that of the actual Halloween Haunt itself. Just as the Halloween Haunt had “modest” beginnings and nobody knew if it would fly or not, Ultimatehaunt.com too started off very tiny and has grown and grown. The website’s concept was first discovered in December of 1999. Searching the Internet for Halloween Haunt websites or information led to constant dead-ends. So, why not create our own? We had some pictures and content…but we also had a professional web designer! We had the drive to do something fun that perhaps someone out there might enjoy. After a few months of constant scanning and building, the website was launched on the Internet in April of 2000. Expectations? We had none. We were hoping that one person out there might find the site and like what we had done. We “day dreamt” and thought, “How cool would it be to have one of the Knott’s Scary Farm Monsters email us because of the website?” Little did we know what the future had in store for us! It was within weeks that the website built momentum and even grew a fan base! Haunt fans from all over the WORLD were discovering the website and sharing the same passion for the event that we have. The characters of the event were the drive and life blood of the website while the fans were the fuel. The website was no longer just run by two people, but hundreds and hundreds of fans and monsters creating the entertainment for themselves. In our first October (2000), Knott’s Berry Farm sponsored a contest for Ultimatehaunt.com where the winner was awarded an opportunity to become a Ghost Town Street Monster for a night on Halloween night as well as a Haunted Dreams Package!! It was amazing to us that we had reached a cool spot in a short amount of time. Wow! A contest sponsored by the park itself! How awesome is that? Knott’s even linked Ultimatehaunt.com to the official halloweenhaunt.com for the month of October that first year. It was simply amazing to us. Knott’s Berry Farm continued to sponsor contests for Ultimatehaunt.com every October since 2000 until 2009 when time caught-up to us and “real” life got in the way. The 2000 Ultimatehaunt.com Prize Winner on the left. In a nutshell, that was the beginning of the website that you are looking at along with, of course, all of the hundreds of wonderful people who have supported us. They are what made this “monster” of a website. The website has continued to grow at a steady rate since April of 2000 and it just keeps getting bigger and better. Why are we sharing all of this with you?? Well, certainly not to pat ourselves on the back. This website isn’t just for us anymore. We are sharing this information simply to let you know that this website is truly run by fans for the fans. The fans and characters that we have met and communicated with through this website are what make this The Ultimate Halloween Haunt Experience. This site WOULD NOT exist if it wasn’t for the dedication, participation and support we receive from the visitors of Ultimatehaunt.com. All the people working together, sending in their pictures, information and stories are what makes this website something special. You are the power for this website. If it wasn’t for you, this website would not exist…and that’s the absolute truth. On behalf of Ultimatehaunt.com and your fellow fans, we thank YOU! 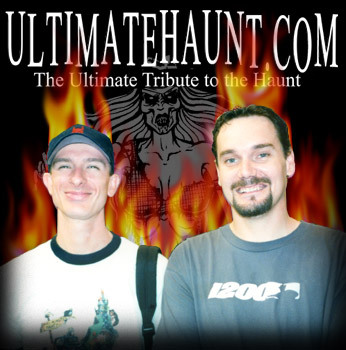 Ultimatehaunt.com was created by Ted Dougherty and Mark Marcoux. You can visit Mark at www.mhmdigital.com to see some of the incredible work he has done in the world of webdesign. relationship with the Knott’s Berry Farm/Cedar Fair Company. Many of the images on this website are copyrighted by the Knott’s Berry Farm/Cedar Fair Company. They own the exclusive rights to reproduction, meaning that technically we have no right to use them without permission. The images are placed on this site with the intent to promote Knott’s Scary Farm Halloween Haunt and Knott’s Berry Farm/Cedar Fair. We do not believe that any usages we have committed can affect sales or incoming moneys to the Knott’s Berry Farm/Cedar Fair company, except to increase them. That being said, we intend no implication of rights of reproduction. Large corporations are finding themselves walking a fine line concerning maverick Internet web sites, between promoting fan awareness and involvement, and protecting their intellectual property. Ultimatehaunt.com will, in its best effort, never reproduce something on this website that will affect Knott’s Berry Farm/Cedar Fair’s income, nor sell or profit from this website using something that unlawfully utilizes their intellectual property. This site is solely for entertainment. Knott’s Berry Farm has a good reputation for supporting, or at least withstanding, fans and supporters of the company. The Ultimate Halloween Haunt Experience wishes to become such a vehicle of support for fans of Knott’s Scary Farm Halloween Haunt.